Schedule and book your dishwasher repair service online. A professional repairman will arrive with all required tools. He will diagnose your appliance and replace the faulty components. Receive a free check-up of your appliance before the expert leaves. 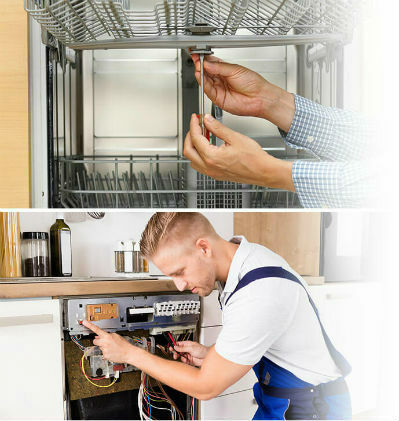 What will your dishwasher repair service in London include? Regardless of the cause, the specialist will help you bring it back to life using industry-standard tools and parts created for your exact model. Your service will include a 1-year guarantee that includes any repairwork or replaced parts by the qualified technician. The repairs are done with original components to deliver quality results. A City & Guilds of London Institute certification means that your dishwasher repairman can handle all sorts of repairs of both new and discontinued models, as long as the work provided is cost-efficient. He will also source the equipment and spare parts needed to perform the task. Each of the specialists has a flexible schedule, so you can make an appointment for any day of the week, excluding Sundays. Next-day appointments can easily be arranged. Upon request, our trusted service partner can give you expert dishwasher maintenance advice to improve the efficiency of your appliance and protect it from any further forms of damage. What happens if my expert needs to order more parts? If that happens, the technician will schedule a follow-up session to install the components. This second visit, however, will only cost as much as the total price for the ordered parts. Will the repairs take too long to complete? Unfortunately, this is not something that your dishwasher engineer can assess right away since the time spent will depend on how severe the damage is and on the type of parts that need to be replaced. Most jobs, however, will usually take one to two hours to complete. Are your services extending to landlords as well? Absolutely. Each service by the company we partner with is equally suitable for homeowners, landlords, tenants and estate agents located within the M25 zone in London. Can I pay for the job with my credit card? Yes, each of the operatives will carry a mobile card payment machine for your convenience.